The emergency device – used to give a high energy electric shock to the heart to someone in cardiac arrest – is now available for use at Busy Bees nursery on Sir John Robinson Way. The automated external defibrillator (AED) has been installed as part of the nursery’s commitment to safeguard children, staff, parents and visitors in the event of a cardiac arrest. To mark Family Safety Week (April 1 to 5) staff and parents at Busy Bees were joined by first aid trainers following the installation of the AED. Training sessions were delivered to staff, demonstrating how to use the AED and deliver CPR. 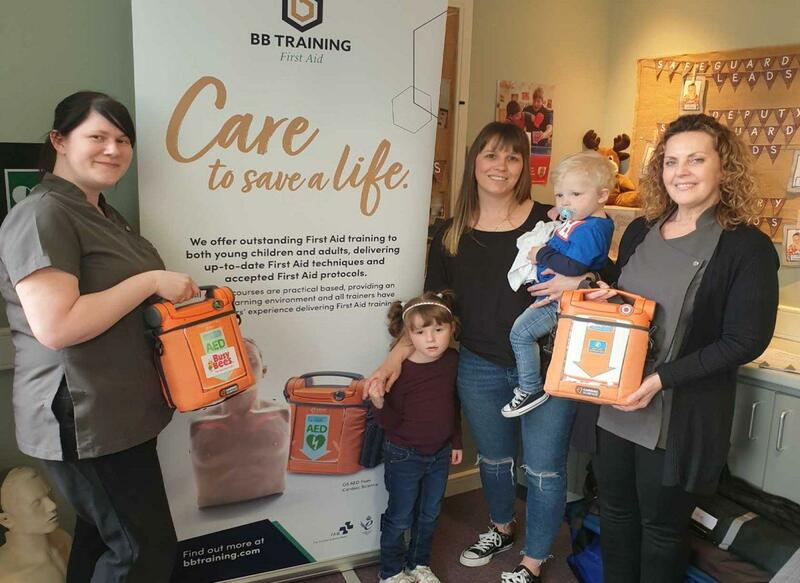 Karen Bird, head of first aid at BB Training, which ran the CPR workshop in the nursery, said: “Every year in the UK there are 30,000 out of hospital cardiac arrests, with a survival rate of fewer than 1 in 10. The nursery installed the AED as part of a nationwide campaign that has seen Busy Bees introduce more than 350 AEDs in its nurseries throughout the UK. The industry-leading scheme will help boost the survival chances of people who have an out-of-hospital cardiac arrest. The AED, supplied by Cardiac Science, has both adult and paediatric pads. It was specially chosen as it provides both text and voice prompts to the rescuer to enable them to remain focused during the high-pressure situation. Anna Allen, nursery manager at Busy Bees, Daybrook said; “Protecting and safeguarding the children in our care is our top priority and that’s why we’ve undertaken this potentially lifesaving initiative. We see it as part of our commitment to best practice and to deliver outstanding care to our children, as well as to protect staff, parents and visitors.